Archaeologists have made major breakthroughs in their understanding of the famous Staffordshire Hoard after it was brought together in its entirety for the first time since its discovery. The hoard was discovered buried in a field five years ago, but now all 4,000 parts have been collected for study. The thousands of intricate pieces of gold, silver and garnet, many of them showing highly detailed craftmanship and now free of mud, were laid out on a table at Birmingham Museum and Galley. By bringing all the various pieces of Anglo-Saxon gold, most of it decoration for swords, daggers and armour, together in one place experts have discovered more than 600 new links, joins and associations between the parts. Shattered pieces of sword decoration and helmet were put back together like pieces of a jigsaw puzzle to give experts a new perspective on the buried treasure. A piece, initially thought to be a seahorse, has now been identified as more likely to be a pair of stylised horses linked together or perhaps, less likely, a wolf. Experts also now believe the vast majority of the hoard is martial in nature, suggesting it was not just kings who went into battle with highly decorated weaponry and armour. But questions also remain over some items, with few clues to the use of the chess-board patterned Millefiori Stud. For historian Chris Fern the unique discovery has also shed new light on the Anglo-Saxon poem Beowulf. He said: “The great poem Beowulf, once believed to be artistic exaggeration, now has a true mirror in archeology. “We thought it was a piece of exaggeration, or poetic spin. We did not think that this much gold was carried by the warrior class. The setting out of all the items has allowed experts to group the pieces and find links. David Symons, curator of antiquities and numismatics at Birmingham Museum said: “The exercise we’ve been going through has been absolutely crucial to the hoard project. He said that they have been able to find pieces which were clearly linked together, and in other cases see where designs matched and items may have been made by the same jeweller or goldsmith. He said that one of the more unusual aspects of the hoard is that much of the study has taken place in the public glare. Traditionally, where there is an archeological find, experts take the items and study them, draw conclusions and publish their findings and only then do the items find their way into museums or public display. The hoard went on display within weeks of its discovery in Birmingham, Stoke, Tamworth and Lichfield. The hoard was discovered near the village of Hammerwich near Lichfield in a farmer’s field next to the A5 in July 2009 by treasure hunter Terry Herbert using his metal detector. A second batch was found nearby in November 2012. It was valued at £3.2 million and bought by Birmingham and Stoke-on-Trent museums following a fundraising appeal. After being assembled for the study the hoard has again been broken up and pieces shared with the museums which form the Mercian Trail, where it is now on show. 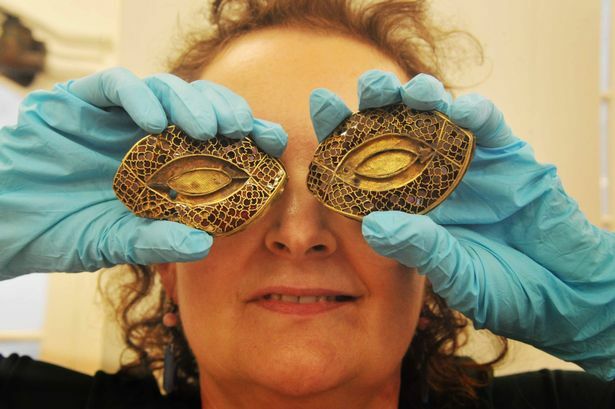 Work is currently under way on a new exhibition at Birmingham Museum and Art Gallery to display part of the hoard in a purpose built gallery and provide visitors with an insight into the Anglo-Saxon world. It is due to open in September. Visitors to Stoke-on-Trent’s Potteries Museum will also be able to see 180 pieces from the hoard displayed in a recreated seventh century mead hall, as part of an exhibition to set the fragments in the context of the life and times of the Anglo-Saxon Midlands.